Watching the media this week, I saw highlighted our society’s paradox in the pursuit of relief from chronic pain. On the one hand, we see nearly daily media stories on the opioid epidemic; on the other, commercial products continuously promise for “fast relief” for every type of physical discomfort. And no surprise…the stats also tell the story. 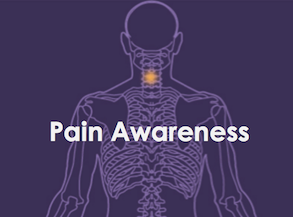 As many as 100 million people are suffering from chronic pain in the United States alone. Half of the U.S. adult population over 50 will develop a chronic pain problem at some point in their later lives. September is National Pain Awareness Month and a good time for us as therapists to look at the range of tools and techniques — concepts often not covered in the media — that we can use to help our patients regain quality of life. Bring your patients the full range of techniques to relieve chronic pain…learn more about Maggie’s training program. Experts have noticed that experiencing a traumatic event can have an impact on the development of pain. In fact, approximately 15-30% of patients with chronic pain also have PTSD. Often, physical pain functions to warn a person that there is still emotional work to be done; it can also be a sign of unresolved trauma in the nervous system. Even if an individual has grieved and processed the emotional impact of a trauma, the nervous system might still unwittingly be in survival mode. Although a client might not be aware of the lingering effects of trauma, the body may be clinging to unresolved issues in the case of chronic pain problems. Just as the human body has an immune system to protect it from dangerous physical organisms, the human mind has a kind of “mental” immune system to protect it from the painful reality of overwhelming pain and its related problems. The purpose of this psychological defense is to protect our mind and personality from what it cannot tolerate. Relevant psychotherapy can help to resolve the physical problems by working with the physical sensations of pain as well as with unresolved emotional stress that can be contributing to the problem and blocking the effects of healing. Two primary antidotes to denial are acceptance and problem solving. Acceptance is a peaceful acknowledgement of the truth. ; problem solving is a system for finding solutions to various problems, which can then be employed. Using these approaches, the need to use denial will go down because the ability to manage problems will go up by taking action. Enhance your skills for building specific protocols with your clients…learn more about Maggie’s training program. One of my patients, a recovering addict, had been recently tapering off of opiate medication after surgery until he injured himself by falling on his lower back and hip. His pain level had been steady at 2-4 on a 10 pt. scale. The new pain problem sent his pain up to 7 or 8 and he obtained several recommendations from his doctors to increase the opiate. In his work with me, this means adding more skills not more pills: effective pain protocols built on specific skills, such as breathing and connection. Your practice can be part of the solution to easing chronic pain and opioid dependency. Learn more about Module 3 on finding freedom from emotional problems and physical pain…learn more about Maggie’s training program. We can leverage our expertise in pain treatment to increase our clients’ well-being. As professionals, we also have an opportunity: joining the campaign to raise awareness about various options for the millions of people who suffer from chronic pain.